After receiving the necessary qualifications after obtaining 2 years R & D / teaching qualification with a postgraduate diploma in Scientist-C (Medical) ophthalmology postgraduate degree (MS / DNB) ophthalmology in 01 year R & D / teaching experience or ophthalmology. MBBS Degree recognized by MCI with 4 years R & D / teaching experience in ophthalmology after MBBS degree. Scientist-C (Medical) MBB degree is accredited with 4 years R & D / teaching experience after getting a qualified qualification recognized by MCI. Scientist-B (Non Medical) Environmental Science First Class Master Degree in Environmental Science from a recognized University. 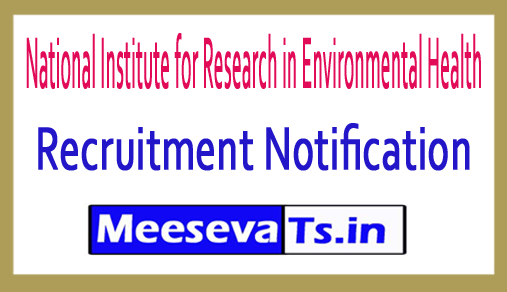 Second class MSc + PhD degree in Environmental Sciences from a recognized University. Second class MSc + PhD degree in Chemistry (Analytical / Organic) from an accredited University. Scientist - First class Master Degree in B (Non Medical) Biostatics Biostatics / Statistics from a recognized University. Second class MSc + PhD degree in Biostatics / Statistics from a recognized university. Accounting Officer (Junior Grade) a) Bachelor's degree in any subject from a recognized university is three years. Section Officer A) The degree of bachelor degree in any subject from a recognized university is three years. C) Two years of work experience in Administration / Establishment / Store and purchase cases etc. Minimum three-year undergraduate degree in any subject from a recognized university. Technician 10 + 2 in science subjects with 55% marks and one year certificate / diploma in Medical Laboratory Technology / Radiology Lab Technology from a government recognized institution. Interested and qualified candidate can download the website from nireh.org in the prescribed form and send your application on or before 20-09-2018. The prescribed format with photocopy of all relevant documents should be submitted to the address specified below.